Humans have been killing other humans since the dawn of the species, but owing to the poor archaeological record, it’s unclear what sort of weapons our ancestors used to brutalize one another. Using models of human skulls and a replica of a weapon dating back thousands of years, researchers have shown that a bat-like club known as the “Thames Beater” was fit for the task of killing. Humans have been constructing implements of destruction for thousands of years, including sharpened stones, spears, daggers, bows and arrows, and clubs. 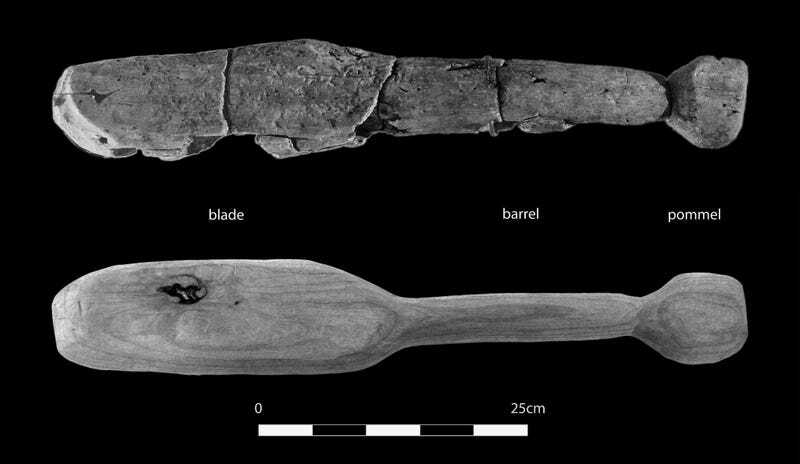 Some of these weapons were used for hunting, but early humans also used these weapons against one another—we’re just not entirely sure which ones. We know this because archaeologists have uncovered many burial sites in which the human remains exhibit horrific injuries, such as blunt force trauma to the skull, cracked bones, and other signs of combat. Human warfare dates back about 10,000 years, and though we tend to harbor romantic thoughts of the “Noble Savage” and peaceful agrarian existence, the sad truth is that ancient farmers were shockingly violent. But as mentioned, connecting injuries to specific weapons has proven difficult. To overcome this shortcoming, archaeologists Meaghan Dyer and Linda Fibiger from the University of Edinburgh ran a fascinating—if rather morbid—experiment to determine if one particular weapon, the “Thames Beater,” could be implicated in Neolithic-era blunt force skull injuries (the Neolithic period ran from about 7,000 BC to 2,000 BC). Their resulting study, now published in Antiquity, shows it would make for a very effective murder weapon, indeed. In a nutshell, the researchers used a replica of the Thames Beater to create injuries in a model of the human skull, which were then compared to injuries found in the remains of actual Neolithic-era victims. To do so, the researchers engaged in a bit of experimental forensics not unlike modern efforts to determine cause of death. Instead of using an animal carcass or a human cadaver, the researchers opted for a synthetic polyurethane “skin-skull-brain” model coated in rubber skin. A hole was left at the bottom, through which the researchers injected a brain-like gelatin mass. Two skin-skull-brain models of different thicknesses were used to account for human variance. Dyer and Fibiger believed this model more accurately represented the shape and strength of the human skull compared to an animal carcass, and that it was more ethical than battering away at a human donor’s corpse. The weapon of choice for this experiment was the aforementioned Thames Beater, radiocarbon-dated to about 4,600 years ago, was found near the Thames river in the early 1990s. For archaeologists, this represented a spectacularly rare find, as few items like this are known to exist. The item, which is kept at the Museum of London, is cracked, chipped, and generally in pretty bad shape. It looks like a mishmash of Bam Bam’s club from the Flintstones and a cricket bat. It even has a rounded pommel. When it was in good shape, the Thames Beater measured about two feet in length. It doesn’t take much imagination to see this object being used as a formidable weapon. Obviously, the researchers couldn’t use the original Thames Beater, so they recruited the help of master carpenter David Lewis of Cornwall, who recreated the object using alder wood. Lewis did his best to recreate the club’s weight, shape, dimensions, and other attributes. Finally, the whacking could begin. A 30-year-old male was recruited to do the hitting, which he did as if he were defending his life. The resulting fractures on the simulated ball-shaped skulls resulted in depression fractures that were deep enough to displace bone and produce cracks that spread throughout the skull. These injuries were consistent with what would be expected from blunt force trauma. What’s more, the researchers compared these injuries to the damaged skulls of remains found at Asparn/Schletz—a Neolithic massacre site in Austria. Again, the injuries were nearly identical. “The fracture morphology, shape of displaced fragments, and the beveled fracture edges produced in both spheres match very closely with trauma hypothetically linked to wooden club weapons,” wrote the authors in the new study. Of course, just because the Thames Beater can produce these kinds of injuries doesn’t prove it was actually used by Neolithic peoples to bash in each other’s skulls. But it’s a safe bet they did—just look at that thing. It would make for a very poor hunting weapon (unless used to knock an animal out of its misery), but a very effective one-on-one weapon. Importantly, this approach to archaeology could lead to similar analyses of other suspected weapons, and shed new light on ancient Europeans. As this study affirms, we humans can be our own worst enemies. Correction: A previous version of this article stated that the club dated back to 4th century BC, whereas it’s actually about 4,600 years old.